I am very pleased with this purchase. I’ve used this pan primarily for baking biscuits and cookies. Even though it’s non-stick, I still use a bit of oil spray to endure there is no sticking. It’s fairly heavy, and with proper care, I believe this pan will last a long time. Thanks to the Gotham Steel Cookie Sheet, Dessert time just got more enjoyable. No need to season your pan with oil or butter- throw food right in & pop in the oven! 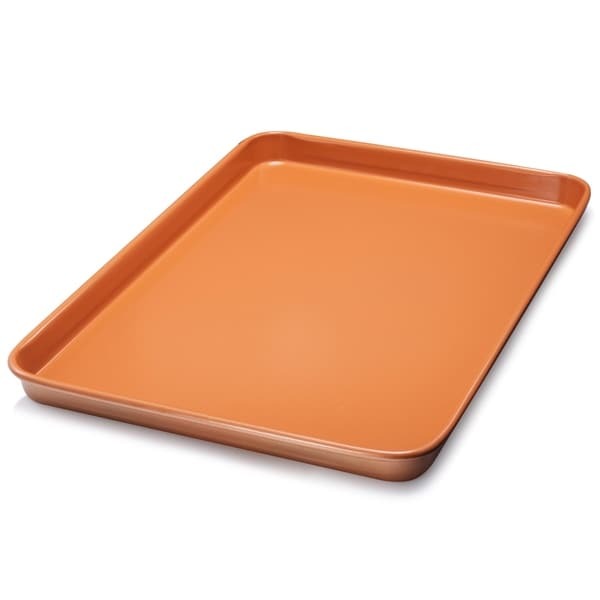 Serving has become easier too, thanks to the pan's non-stick & non-scratch surface, food slides right off. You can even cut up pizza with a pizza cutter right inside the pan without having to worry about the coating scratching or peeling off. Clean up is a breeze too, because the Gotham Steel Cookie Sheet is Dishwasher Safe! Bake chicken, bacon, eggs, steak ,brownies, veggies, pizza & more right in your oven with little to no oil. Making it easier to bake 'guilt- free' snacks with less calories & fat! This Gotham steel cooking sheet and Jelly Roll pan is great. It is so easily cleaned and there is no sticking to the pan. I very highly recommend these pans for your baking. The cookies come out perfect. These are truly non stick. Food slides right off and clean-up is so easy. I purchased not only the above cookie sheet and jelly roll pans but two sets of baking pans. The pans are great, easy to cook/bake on. I purchased these pans for my husband since he does all of the cooking, I thought he deserved something really nice. The only problem I have experienced was when reviewing the pans in the set there was only one round cake pan. Anyone who does a lot of baking would normally use two round baking pans to make a cake. My advice to the manufacturer is to review the Baking pans in the set and add one more round cake pan. A pan to last instead of only a little while! Great using and baking on this heavy duty cookie sheet. Very easy to clean. No sticking or stains. Don't need to line it or use spray either. Just a great pan. Will pay for itself many times over!! I love copper chef baking pan. Its really easy to cook without been stick on the pan. I enjoyed cooking on copper baking pan without a mess to clean up. This is the best cookie sheet I have ever had and I have had many... Nothing sticks to it and it does not scratch.. This is the only brand I will ever usr. Bends a little in oven at high heat and heard popping sound. Non-stick, easy clean. Good size. Update. Use it all the time. Have made rolls and all sorts of things I have backed on it. Nothing sticks. Easy clean up. Love all my Copper pans. As with all the tv products, I was skeptical about the pans. We put them through the paces with a frenzied cookie marathon and they worked well every time. As a jelly roll pan they were still good, but my wife did not like how the size of the pan made her roll seem to be thinner, she'd prefer to use a standard cookie sheet. Curious to see how the pans perform after some time and multiple uses have passed. Love this copper baking sheet ! I hope to get the entire collection. You can bake on it and, so far, it doesn't tarnish. Very nice and very pleased. Very Large, and very easy to clean. A must for baking without cleanup. Tired of dirty pans that no longer will clean up.